Commandant Gade, St. Thomas, U. S. Virgin Islands The Jaredian Design Group has provided design services for the renovation of the Family Resource Center, Inc.—Spenceley Center. This design included historical restoration as well as a contextual historical infill structure. Construction was completed in December 2012. Red Hook, St. Thomas, U. S. Virgin Islands The Jaredian Design Group provided design services for the design services for the build-out of the V. I. Internal Revenue Bureau’s St. Thomas headquarters. St. Thomas, U. S. Virgin Islands The Jaredian Design Group provided design and construction management services for the renovation and restoration of Roosevelt Park, a historic site in Downtown Charlotte Amalie. The construction includes new landscaping, walkways, Veterans’ Monument and plaza, and children’s playground. The park was dedicated in November 11, 2007. In 2008, Jaredian Design Group was recognized by the St. Thomas/St. John Chamber of Commerce for design excellence for the park. St. Croix, U. S. Virgin Islands The Jaredian Design Group designed the Christiansted Boardwalk, an enhancement that provided and will provide a continuous walkway from Gallows Bay to the Seaplane Shuttle in Christiansted, St. Croix. The first phase of the project from King Christian to the Seaplane Shuttle has been completed and has provided economic opportunities to commercial properties along its length. Its success from the very beginning, the boardwalk has been featured in nationally advertisers, notably Cache. The second phase of the project from Fort Christiansvaern to Gallows Bay is pending a construction schedule from the GVI. St. Thomas, U. S. Virgin Islands Prepared damage assessment report and bid documents for the hurricane restoration and repairs of the Government Employees’ Retirement System Headquarters following Hurricane Marilyn in 1995. Renovation was accomplished while the facility was fully occupied. St. Croix, U. S. Virgin Islands The Jaredian Design Group has provided design and construction administration services in connection with the renovation of the existing Charles Harwood Medical Complex. Our services also included the development of the Space-Planning Program. The design is for the entire complex, which is 88,000 square feet in size. The renovations were completed in 2004. St. Croix, St. John & St. Thomas, U. S. Virgin Islands Providing Construction Management, Programming, Planning, and Architectural/Engineering Design for the Virgin Islands Government Department of Health to rehabilitate and plan the Territory's Public Health facilities. This project was started in April 1993, and continued through the first quarter of 1996. The project is approximately 100 % complete. Some of the projects included the Governor Juan F. Luis Hospital - Kitchen and Laundry Renovation, East End Clinic, Knud Hansen OCCS Building Renovation, Charles Harwood Plumbing and Electrical Repairs, Charles Harwood Clinic Design and Knud Hansen Space-planning Program. St. Croix, St. John & St. Thomas, U. S. Virgin Islands Provided Construction Management, Programming, Planning, and Architectural/Engineering Design for the Virgin Islands Government Department of Health to rehabilitate and plan the Territory's Public Health facilities. Several of the projects included the St. Croix Modular Hospital Demolition, Charles Harwood MCH Administration Renovation and the Myrah J. Keating Smith Clinic Birthing Center. St. Croix, St. John & St. Thomas, U. S. Virgin Islands St. Croix, U. S. Virgin Islands Developed space-planning layout for the medical equipment to be located in the St. Croix Hospital for the Virgin Islands Government Department of Health. This project was completed by the end of June 1994. St. Thomas, U. S. Virgin Islands The Jaredian Design Group provided architectural design and management services in connection with the rebuilding of the St. Thomas Reformed Church after Hurricane Marilyn. The rebuilding program included restoring the historic sanctuary, parsonage and parish hall. Our services were donated. The sanctuary restoration was recognized by the St. Thomas Historic Trust in 1999 for excellence in historic preservation. St. John, U. S. Virgin Islands Client: Rosewood Hotels Provided Architectural/Engineering services in connection with the reconstruction of the housekeeping building at the Caneel Bay Hotel. The original building was destroyed by fire in 1999. Our services included coordination with CZM in obtaining a waiver of the required permits. Construction was completed within five months. St. Thomas, U. S. Virgin Islands Client: Frenchtown Evangelistic Assembly Provided Architectural/Engineering services in connection with the construction of a new sanctuary and classroom building for the Frenchtown Evangelistic Assembly. The location of the site, a flood plain, and the shape of the lot made the design restraints challenging. Construction was completed in 2000. St. Croix, U. S. Virgin Islands The Jaredian Design Group provided design and construction administration services in connection with the renovation of the historic Frederiksted Health Center. The facility is approximately 12,000 square feet in size. The design is completed. St. Thomas & St. John, U. S. Virgin Islands The Jaredian Design Group provided technical evaluation and roof design services as a sub-consultant to Apex/Kennedy on the Governor’s Home Protection Roofing Program following Hurricane Marilyn in 1995. Jaredian performed over 239 inspections and completed 85 roof designs. 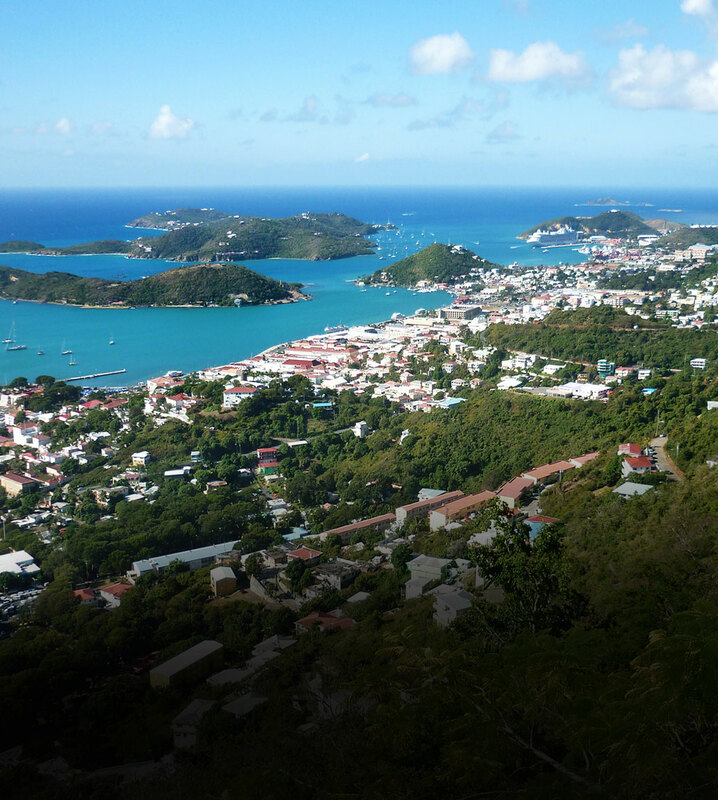 St. John, U. S. Virgin Islands The Jaredian Design Group is provided services in connection with the infrastructure development of a 68 parcel residential community over 80 acres on the east end of St. John. The services include CZM coordination, roadway and storm drainage design. St. Thomas, U. S. Virgin Islands Prepared Bid Documents for the V. I. Port Authority to renovate their executive offices at Cyril King Airport to incorporate the Americans with Disabilities Act. This Project was completed in August of 1995. St. Thomas, U. S. Virgin Islands Provided Architectural/Engineering services in connection with the renovation of the Lieutenant Governor’s Executive Office Building damaged by Hurricane Marilyn in 1995. The renovation was recognized by the St. Thomas Historic Trust in 1999 for excellence in historic preservation. St. Thomas, U. S. Virgin Islands Provided Architectural/Engineering Services in connection with the renovation of Seslia Securities on Crystal Gade in 1999. Lovango Cay, St. John, U. S. Virgin Islands The Jaredian Design Group provided A/E services in connection with the infrastructure development of a family estate on the cay of Lovango, which is off the shore of St. John. Our services include CZM permit coordination, roadway design, utility distribution design, and dock design. St. Croix, St. John & St. Thomas, U. S. Virgin Islands Assisted the Virgin Islands Government in the settlement of the insurance claim related to hurricane damages from Hurricane Marilyn. Jaredian worked in conjunction with the Government’s insurance adjuster providing site inspections, technical evaluations and cost estimating. St. Thomas, U. S. Virgin Islands Provided Architectural/Engineering Services in connection with the renovation of the historic Inn at Blackbeard’s Hill in 1999. The design restored and enhanced historic features at this historic property, which is part of the National Register of Historic Places. St. Croix, St. John & St. Thomas, U. S. Virgin Islands The Jaredian Design Group has provided unlimited scope services for the United States Postal Services - Caribbean District. Project scopes are negotiated on an individual basis for various facilities. This contract commenced in 1996 and does not have a term date. Several projects have been completed, including the Havensight Postal Store. St Thomas, U. S. Virgin Islands The Jaredian Design Group has provided A/E services in connection with improvements to an existing 2.5-million-gallon-per-day sewage lagoon located at Cyril E. King Airport in St. Thomas. The improvements included sludge removal, aeration and chlorination system repairs. St. Thomas, U. S. Virgin Islands Provided Architectural / Engineering design services for an 80-seat restaurant in the Edward Blyden IV Marine Terminal on Veterans Drive, St. Thomas, U.S.V.I. in 1993. The work included kitchen and bar design, as well as seating layout. St. Thomas, U. S. Virgin Islands The Jaredian Design Group performed inspection services in connection with the hurricane restoration of the Plantation Manor Condominiums. St. Croix, U. S. Virgin Islands Developed Concept Design for a 108-unit-multi-family residential community at Estate Mount Pleasant, St. Croix for the ABAMAR Housing & Development Corp in 1992. St. Thomas, U. S. Virgin Islands The Jaredian Design Group prepared bid documents for the hurricane repairs at the Towers Condominiums. The roof repairs were completed under the Governor’s Home Protection Roofing Program. Jaredian provided construction administration services. Construction was completed in the fall of 1998. St. Thomas, U. S. Virgin Islands Provided Master Planning services for the design of a 50,000 square foot multi-purpose commercial and public facility at Estate Fortuna, St. Thomas for the Virgin Islands Housing Finance Authority in 1993. The center will include a church government health clinic, offices, and retail shops. St. Thomas, U. S. Virgin Islands The Jaredian Design Group is designing thirty luxury residences for the Peerless Development Group to be constructed on the East End of St. Thomas. The residences will be approximately 3,500 square feet in size each. Design and construction have already started and will continue through the completion of the project.